I sometimes get hung up on a particular type of quilt. In the past there have been many string quilts, and many many patchwork quilts out of all my favorite fabric lines. Currently? Strip quilts. And I think I should apologize ahead of time for the number of strip quilts you may see here coming up. I’ve been a tad obsessed! I know I said I wasn’t going to make any more quilts for the baby, but I think you should have known that was a lie. A Flea Market Fancy quilt was a necessity. I’m hoping that the baby will embrace a little pink in his life! I used gray for the backing, along with two pieced sections which were left over from the front. I always like straight line quilting on strip quilts – it creates a nice pattern of horizontal lines on the backing. I’ll be back soon with another strip quilt! 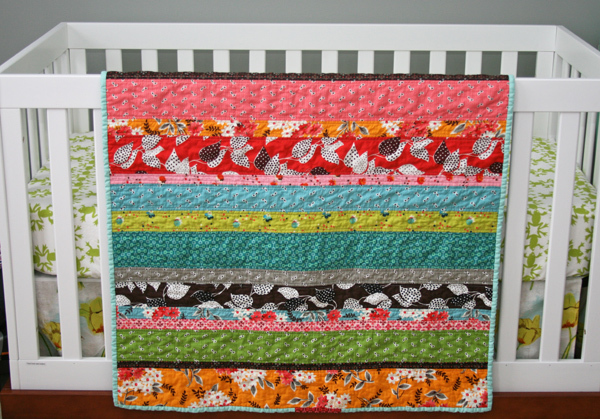 This entry was posted in [search] Strip Quilts, baby, Finished Quilts, Posts about Quilts, Quilts and tagged baby quilt, denyse schmidt, flea market fancy, handmade, quilt, quilting, strip quilt. Bookmark the permalink. wow, I love this. If anyone can make me forgo garment sewing to take up quilting, it’s you! I love it! It think its bright and cheery even for a little boy. I’ll have to keep the strip idea in mind for upcoming quilts. It’s is beautiful. Just keep making them. It is beautiful! 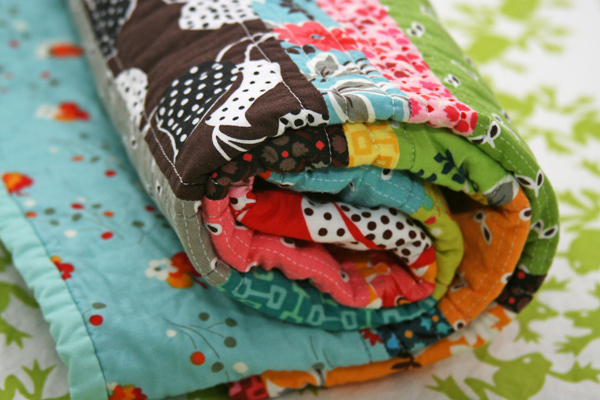 That’s going to be one lucky (and warm) baby with all his quilts! love this! 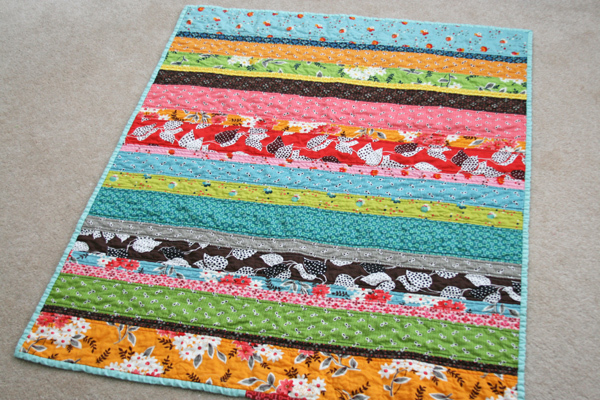 and am inspired to stick with the simple beauty of the strip quilt. Thanks for the reminder! Darling! I too am becoming addicted to strip quilts. I think it all started when I couldn’t bear to cut up a jelly roll. Love the simplicity and lines of a strip quilt. Keep posting yours. You’re inspiring me to stitch some up! Simplicity at it’s best! I hope you’re enjoying these last few weeks! It is beautiful! I love it!!! Love it! Makes me want to run upstairs and start one. I’m sure he’ll like a little pink – it was our next door neighbors’ son’s favorite color until he was about 7. You may also be interested to know that at the end of the 19th century, pink was considered a baby boy’s color, and light blue was a delicate color suitable for baby girls. must.make.today. I never think to make strip quilts, but they are so lovely. It is OK to get obsessed. I am obsessed with hourglass blocks. Oh well. Hopefully my readers don’t get sick of it! You don’t have to worry about that, we love seeing everything you make! Oh P.S. it is OK to have 75 quilts for the babe, he is going to vomit on everything you own so you should cover all surfaces with quilts. That should be your goal. This is great. I have been wanting to try strip quilts. This is wonderful inspiration, thank you! If there a male equivalent to the Princess & the Pea – with quilts instead of mattresses, then I think I know where he’ll be sleeping! 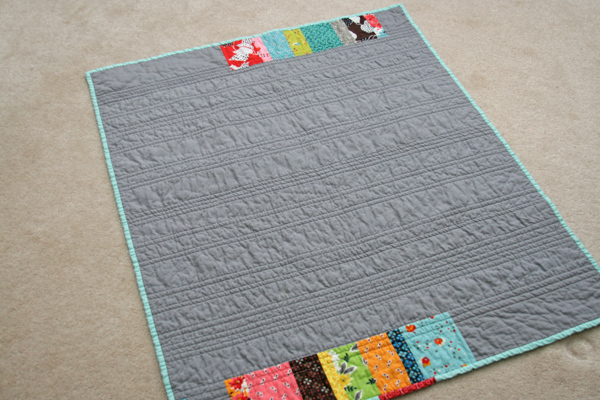 Another totally lovely quilt; lucky boy! Love it and your little squares on the back! I just made one this last month on my blog. 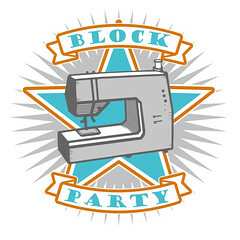 I added big pick stitching to it too. They are so easy to do. It’s great that not a bit of the scraps got wasted. They look great on the back. Just think, if you baby is like my baby (I made several quilts, my friends made quilts, etc.) he will prefer your bath robe. I kid you not! Luckily my bathrobe came with a “blanket.” So my son uses that & “Blankets” that have a similar feel. Oh wow! I have got to find some of that fabric! Your baby is so lucky!! Bring on the strips!! I have two in mind, but I just can’t seem to bite the bullet and go for it. I keep getting hung up on the widths for the strips. 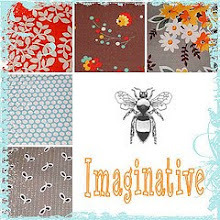 So keep posting your strip quilts … they are quite inspiring!! More strip quilts! I have plans to make one for my daughter so I love seeing the different color combinations and how they change the quilt. I also am getting hung up on the widths for the strips so the more I see the more comfortable I am feeling. Unfortunately, since this line has been out of print for a while, it’s pretty hard to find. You can check etsy or ebay, but be prepared to pay quite a bit for it! Beautiful! I love those colors and I’m sure the baby will too! I am a first time quilter and wanting to make one similar to this with a minky back for a friend of mine that is having a baby. Should I use another material in between to back the quilt itself to keep it from coming apart?? Also, beautiful work and I love your tutorials!! !